Teeth sensitivity can rob you of the enjoyment of so many things. One sip of hot coffee or an iced drink can bring on immediate pain. Sometimes even a breath of air ends with pain. Here is what you need to know about pain relief for sensitive teeth after whitening, other dental procedures, or from tooth damage. Just below the tooth enamel is a layer of dentin, which contains many sensitive nerve endings.These nerves are normally protected by the enamel on the outside of the tooth. 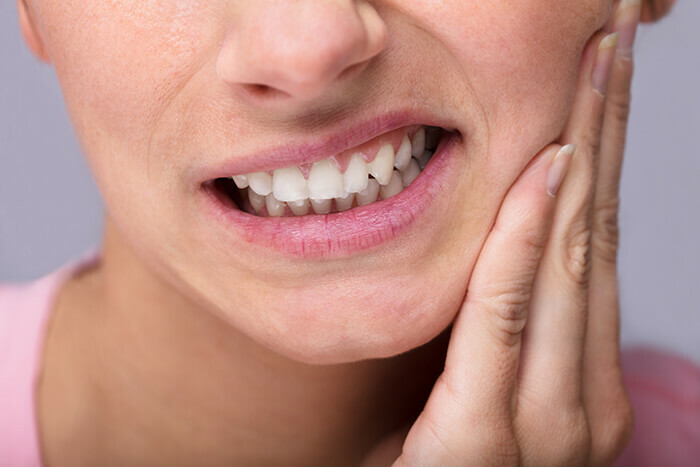 When the enamel is decayed, cracked, or ground down, these nerve endings can become exposed and sensitive to heat, cold, touch, or other stimulus. The results can be painful and sometimes overwhelming. Pain after whitening or bleaching is common and pain relief after teeth whitening usually resolves in a few days. You may also experience pain after cleanings, filings, or crowns. Call your dentist if the pain continues. Receding gums and periodontal disease exposes dentin below the gum line and causes pain. Acidic foods eat away at the enamel, allowing the dentin to be exposed. Not brushing enough or brushing too hard. Heavy abrasion on the enamel can damage it, allowing sensitivity. The chemicals in mouthwash can also be a problem. Drinking sugary soda and other drinks that soften the enamel, leaving teeth vulnerable. Sugar residues promote decay and erosion of the tooth enamel. All sodas, including sugar-free varieties, are acidic. Grinding the teeth, an injury, or even chewing on hard foods like ice or hard candies, can crack the enamel and expose the nerve endings in the dentin. Tooth decay, worn fillings, tooth fractures, gum disease, worn enamel and other tooth damage can cause sensitivity. Call your dentist for the earliest appointment. Prevention is mostly a matter of taking care of your teeth. Brush after every meal and rinse out your mouth immediately after acidic or sugary drinks. Daily flossing is also recommended. It is important to see your dentist as soon as possible when an injury occurs or pain develops. How can Westend Dental Help? Use a soft bristle toothbrush and replace it every 4 months. You may need a less aggressive brushing technique. Use a desensitizing gel containing sodium fluoride to strengthen your teeth and protect against acidic foods. Avoid teeth clenching and grinding. You may need dental treatment such as a filling, a crown, inlay, bonding, gum graft, or even a root canal. Teeth sensitivity after whitening is common and is usually caused by using an overly strong bleaching agent or bleaching your teeth too often. Westend Dental gets a lot of questions about how to relieve tooth sensitivity after whitening. Our best advice is to discuss with your dentist which products are best for you and how often they should be used. Most tooth sensitivity caused by teeth whitening is resolved within a few days, but you can usually get pain relief after teeth whitening by avoiding hot, cold, or acidic foods and drinks during the first few days following teeth whitening.